When ISIS destroyed the Roman monuments in the ancient city of Palmyra, Syria, the world was shocked. From street art to artworks housed in the world's finest museums, the destruction of art is universally understood to be an unforgiveable act. The modern world values works of art as representations of our civilisation and we know how to look after them. We build great edifices to protect them; these buildings do such an important job they are usually designed as great architectural artworks themselves - an echo of the value of what they house. Derek Cowie's exhibition Destruction of National Treasures takes civilisation's ability to value art and pointedly redirects attention to our inability to value another national treasure, the environment. Cowie has reimagined significant historical New Zealand paintings as though they have been found in the rubble of some post-apocalyptic world. They have been destroyed; ripped, torn, battered and there is an unsettling ooze seeping through the cracks in each painting. Ostensibly, viewers are met with an exhibition of ruined paintings, by the likes of McCahon, Hodgkins, Bensemann, Perkins, Stoddart, to name a few. But, closer inspection of the titled reveals the sinister nature of the pervasive secretion in each work. Perkins on Cadmium White re-presents Christopher Perkins' ground-breaking Taranaki from 1931. It is an exquisitely imagined version of Perkins' famous painting, battered and flaking (through Cowie's technique of painting oil paint onto meshed plaster). It is upsetting - that a national treasure could be left to such ruin. However, it is the reference to cadmium (the highly toxic metal widely used in industry and increasingly detectable in our soils) in the title that reveals the rage in Cowie's work. 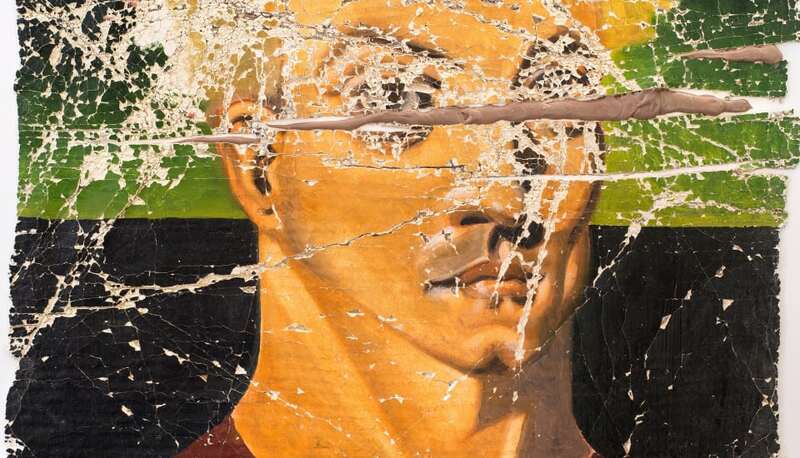 That unsettling ooze in the cracks of the paintings is cadmium-based paint. A viewer's review of the exhibition of ruined paintings segues into a deeply unsettling focus on what is happening to your environment. Unlike artworks, we don't like to talk about the destruction of other national treasures. Cowie's revulsion of the current handling of industrial waste at the unknown cost to our environmental and biospheric futures, leaches through each painting. The artist believes our environment constantly suffers irreparable damage in favour of the big industry dollar, that we are in a state of collapse and that we must act individually. But because of the instability of our economy, large scale industry cannot be stopped or changed without risking breaking the fragile chain of modern currency markets. Discussion about the damage we cause is quietly and politely swept under the rug. It is easier to discuss destroyed art. Cowie's exhibition seeks to redress that silence. Time is up.